Retired December 1, 1944. Died November 14, 1952. 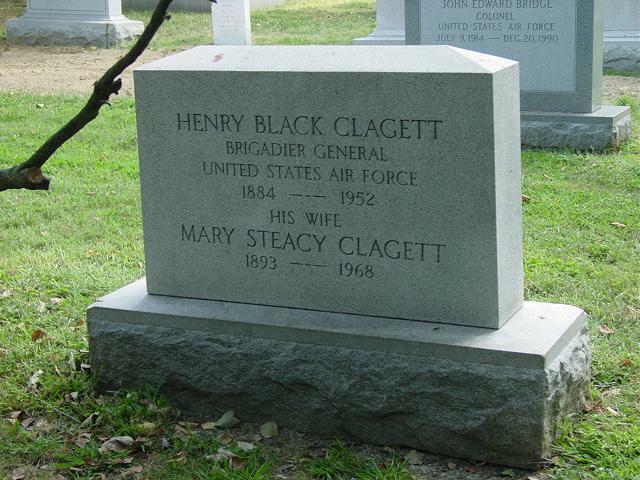 Brigadier General Henry B. Clagett was born at Fort Wayne, Michigan, an Army post near Detroit, Michigan, on Dec. 19, 1884. His early education was obtained primarily in Texas and Wyoming, and the Trinity School in New York, wherever his father, an Army officer, happened to be stationed. His secondary schooling was obtained in the high schools of Cincinnati, Ohio. Desirous of following in the footsteps of his father, he tried for and received an appointment as a candidateat-large at the U.S. Military Academy in July 1902. Upon his graduation four years later, he was commissioned a Second Lieutenant and assigned to the 23rd Infantry with station in the Philippine Islands. During the course of service with the 23rd Infantry, General Clagett was also at Fort Benjamin Harrison, Indiana, and at Fort Bliss, Texas. His six years of continuous service with this regiment was terminated upon his appointment as military aide to President William H. Taft in 1912. He also continued as military aide to the President Woodrow Wilson. In 1914 he rejoined the 23rd Infantry at Texas City, Texas. At the outbreak of hostilities with Germany, General Clagett was serving in the Panama Canal Zone, being on duty there successively with the 19th, 33rd and 5th Infantry regiments. With the rapid aviation expansion which followed America's entry into the World War, he secured an appointment as major (temporary) in the Aviation Section, Signal Corps, with his first station at Kelly Field, Texas. From October 1917 to May 1917, he commanded in succession the First and Third Provisional Recruit Regiments and the Recruit Division. Ambitious to become a flyer, General Clagett won his wings at Rockwell Field, California, where he also received his aerial gunnery training, this being during the period from May 18 to August 22, 1918. He then returned to Kelly Field, Texas, where he commanded the Flying Department and later was post commander until January 28, 1919. Placed in charge of the Southwestern District, with station at Dallas, Texas, General Clagett supervised the regularly scheduled "Flying Circus" of seven De Haviland planes that flew from Boston to Dallas as a promotional tour to recruit men for air service. Later that year he established a record speed for the flight from Washington to New York, making the distance at an average of 168 miles an hour. During the last three months of 1919, he was again stationed at Kelly Field, where for brief periods he commanded the 1st Surveillance Group, the 1st Wing, and the 1st Bombardment Group. For four years, from December 22, 1919, General Clagett was on duty as Air Officer of the 4th Corps Area, with headquarters at Atlanta, Georgia. He was then assigned as a student at the Air Service Tactical School at Langley Field, Va., and following his graduation in 1923, he was assigned as Commanding Officer of Bolling Field, D.C., a position he occupied until August 24, 1926, when he was detailed as Air Officer of the 9th Corps Area, with headquarters at the Presidio of San Francisco, California. Four years later, General Clagett returned to San Antonio and assumed command of the Air Corps Primary Flying School at Brooks Field, Texas. In October 1931, he was once more transferred to Kelly Field, Texas, and he commanded the Advanced Flying School at that station until March 1, 1935. At various times he was in command of the entire Air Corps Training Center. Transferred to Washington, D.C., the general served as Chief of Buildings and Grounds Division, Office of the Chief of the Air Corps, from March 12 to August 19, 1935, and was a student at the Army Industrial College, Washington, D.C., from March 12 to August 19, 1935. From March 3 to July 16, 1936, he was Commander of the 1st Wing, General Headquarters Air Force, March Field, California. After serving for a little over a month as acting Air Officer of the 9th Corps Area, he was assigned as Commanding Officer of Selfridge Field, Michigan, on September 8, 1936. On October 1, 1940, he was appointed a Brigadier General, and since December 18 of that year he was in command of the 6th Pursuit Wing, General Headquarters Air Force, at Selfridge Field. In April 1941, he was ordered to duty in the Philippine Islands where he was commander of the Army Air Forces until a month before Pearl Harbor when the command was taken over by Major General Lewis H. Brereton. During the summer of 1941, he flew to China and parts of Southeastern Asia where he conferred on strategy and defense with Nationalist Chinese, British and Dutch commanders. In November, General Brereton named him commander of the Philippines interceptor force of pursuit planes.